A certified guide with a personal connection to the events shares firsthand stories as you explore the site of the former World Trade Center and the National 9/11 Memorial, where you can pay tribute to the lives lost. Gain a deeper understanding of the events surrounding the attacks on the World Trade Center on September 11, 2001, and the acts of heroism that rallied a nation on this 1.5 hour walking tour of Ground Zero. Upgrade and add on a ticket to the 9/11 Museum to see artifacts associated with that fateful day. Visit St. Paul Chapel, New York City's oldest standing church. During the tragic days following the event, it served as a shelter for rescue workers to sleep and eat. The church experienced its own miracle on 9/11 when a fallen tree protected the building from the debris of the attacks. Take note of the iron fence on Broadway, which was plastered with missing posters of relatives. Then, follow your guide to the 9/11 Memorial, where you’ll gain an understanding of the horrific events of 9/11. As you explore the site where the World Trade Center once stood, you’ll be captivated by real firsthand stories of 9/11 from your guide, who has a personal connection with that fateful day in New York City. 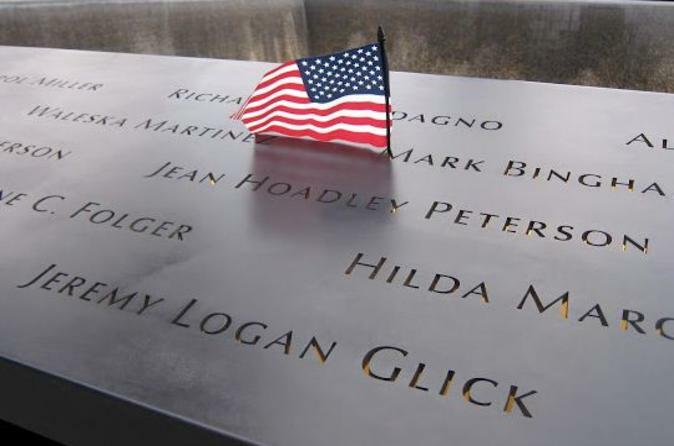 The 9/11 Memorial was built to honor the nearly 3,000 people killed in the terror attacks of September 11, 2001. The names of every victim of the attack are inscribed in panels alongside twin reflecting pools, spanning nearly an acre with the largest man-made waterfalls in North America. You'll have until 6pm to explore the memorial on your own. You can also upgrade to gain admission to the 9/11 Museum. Your private guide will give a brief overview of what you can expect inside the museum, which opened in May 2014. The 9/11 Museum’s 110,000 square feet (10,219 square meters) of exhibition space is located within the archaeological heart of the World Trade Center site. The stories of the 1993 and 2001 bombings of the World Trade Center, and the people affected by the events, are told through multimedia displays, archives, narratives, and a collection of authentic artifacts. The monumental artifacts in the museum present the intimate stories of loss, compassion, reckoning, and recovery that are central to telling the story of the attacks and the aftermath.